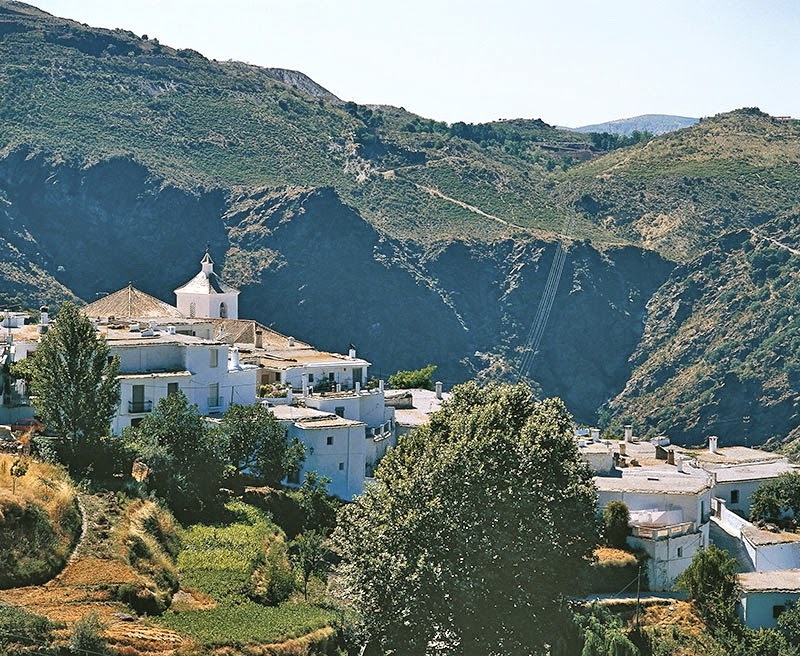 The Alpujarra is the area that is the southern slopes of Spain’s Sierra Nevada mountains. Having walked all over Europe and in North Africa, I can honestly say that the walking here is unsurpassed. This is hill walking terrain rather than mountain walking of the high Sierra Nevada. It is characterized by steep sided valleys, terraces and pretty white washed villages. Although many of these pretty white washed villages provide a good base to stay, Capileira is undoubtedly the best place to base yourself. There are several good day walks to be had straight from the village and other walks could be had by either driving out or by catching the bus. 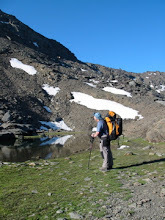 Sierra Nevada Guides have some walks already written up on their website and run a programme of guided walks in the spring (April, May and early June). If you are thinking of a walking holiday for your walking club, then Mountain House Holidays are able to organize a package for you. A full board, fully guided week from £695. It’s hard to pick out a favorite walk as there are so many to choose from, and according to season when flowers are out. 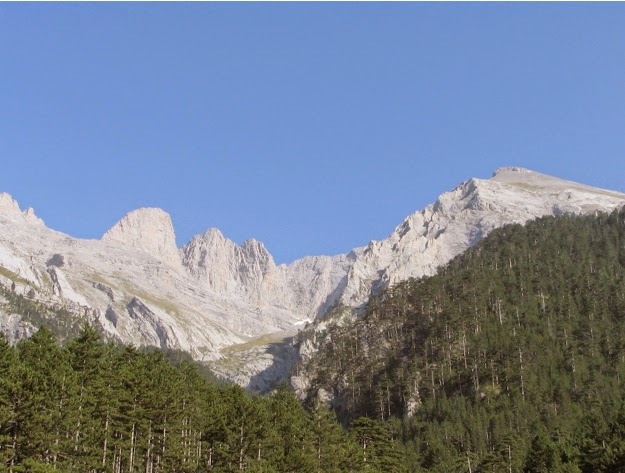 Undoubtedly walking in the Rio Poqueira from Capileira or in the Taha de Pitres provide the best walking. It is also possible to venture up into the Sierra Nevada without having to tackle the mountains. Hoya del Portillo above Capileira provides a good starting point. Only half an hour above Hoya brings us to the viewpoint of Puerto Molino where the higher summits can clearly be seen, especially Mulhacen (the highest mountain in mainland Spain) and Veleta the 2nd highest in the Sierra Nevada. 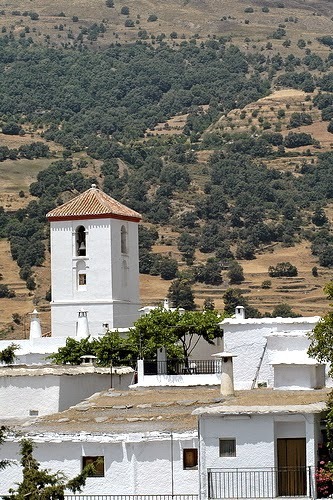 Walking in the Alpujarra can get too hot in July and August. Good times are March to June and September to November. That said, if the sun is out, it is possible to walk in T shirts throughout the winter! If you are restricted to the height of summer, there are several walks to be had in the high mountains where it is cool at altitude. It is possible to catch the National Park bus from Capileira to Mirador Trevelez 2700m asl. You can expect the tempreture at 3000m to be around 15 to 20 degrees during the afternoon in July if it is not windy. With wind chill you might be looking to wear a fleece or jacket. From Mirador Trevelez, the old road leads to The Caldera at just over 3000m. From here a path leads down the Rio Mulhacen and you can make a circuit via the Refugio Poqueira (food, drinks and toilets) before returning to the bus at Mirador Trevelez. Maps and English guidebooks are available locally, but to help with your planning, they can be obtained in advance from Stanfords. The Editorial Alpina map / guide to the Sierra Nevada and Alpujarra is a good start. Spanish maps are usually flimsy so consider getting your map laminated before you go. Accommodation is plentiful. Pensions, Hotels and self catering are all available. If you are planning to visit in the hotter months (mid June through until the end of September, look for somewhere with a pool or plunge pool. It’s great to cool off after a good walk! Mountain House Holidays for a full board, fully guided weeks holiday from £695. Mountain House Holidays and Sierra Nevada Guides are the only qualified British guides (International Mountain Leaders) based in the Alpujarra / Sierra Nevada. We first discovered Slovenia’s Julian Alps on a weeks Spring break in May / June 2011. Since then we have spent a further 5 weeks getting to know the area in some depth. The Julian Alps are believed to be named after Julius Caesar and are the highest mountains in Slovenia with at Triglav 2864m the highest summit. The Slovene people are rightly proud of their mountaineering heritage and the national flag has Triglav represented on it. There is a “saying” in Slovenia that you are only a true Slovene if you have climbed Triglav. As an alpine nation, its mountains are not as high as those in neighbouring countries but they are equally spectacular. There is an extensive network of mountain huts throughout its mountains making it quite possible to stay for longer periods high up without having to keep descending to a valley base each evening. Our first trip was in the spring of 2011. Too early to access the high paths and summits because the high mountains were full of snow. We were able to walk to the summer pastures on the low alps where the cows were being taken up to from the villages and the wild spring flowers were very impressive. We were surprised at the warm weather, though the proximity to the Mediterranean generally gives a warmer and more stable climate than the western alps. The second trip we made was for two weeks in August 2011. The paths and mountains were now mostly clear of snow and we were able to explore the extensive network of paths and huts in the high mountains. Especially memorable was seeing both Edelweiss and the rare, endemic, Zoiss Bellflower. We returned again for two weeks in 2013, this time leading walking holidays for Mountain House Holidays. 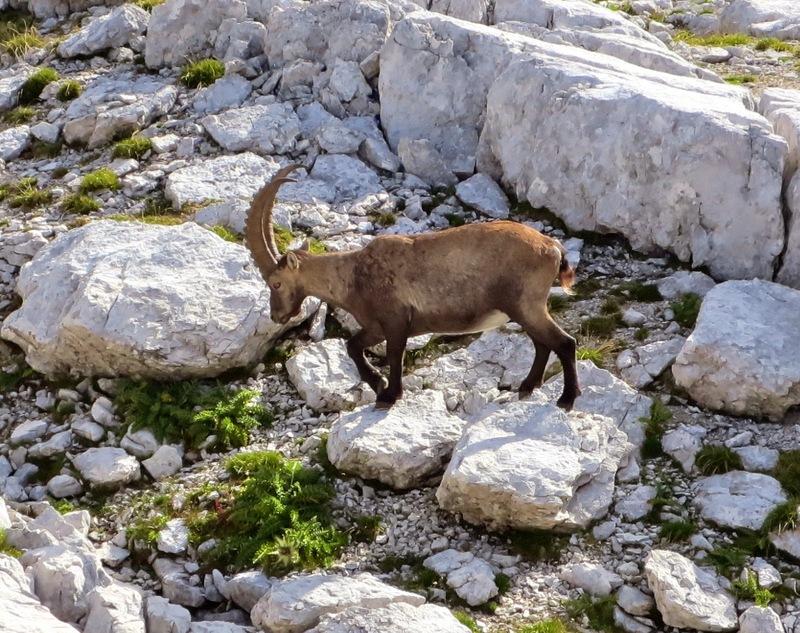 We led two, week long holidays and were able to take our clients to the summit of Triglav. We became true Slovenes! In September, 2014 we had the privilege to return once more leading a hut to hut walking holiday for Mountain House Holidays. Memorable on this trip was the accordion playing that we experienced at all of the huts we stayed at. Situated less than an hours drive from Ljubiana Airport, the Julian Alps are very accessible. There are flights from both London Stanstead and Luton airports. We have found car hire quite cheap though there are taxi’s and mini-bus taxi’s available. By booking them in advance these also work out quite cheaply. If you are planning to visit in springtime, there are lots of flowers out in late May and early June. An ideal base would be around Lake Bohinj. There are plenty of hotels, guest houses and hostels here to suit all. Hostel 13 in Studor offers good clean basic self catering accommodation. Hotel Starre offers good hotel accommodation. For summer hut to hut trips you need a start and end point. The Aljazev Dom at the head of the valley above the village of Mojstrana has a massive “wow” factor that it overlooks the mighty north face of Triglav. This is one of the few huts that has showers and you can get a taxi or drive to within about 400m of the hut. We have also left bags here with our clean travelling clothes to return to on several occasions. If you want a guided itinerary, Mountain House Holidays will help you sort out a suitable itinerary and provide you with a qualified International Mountain Leader who has knowledge of these beautiful mountains. 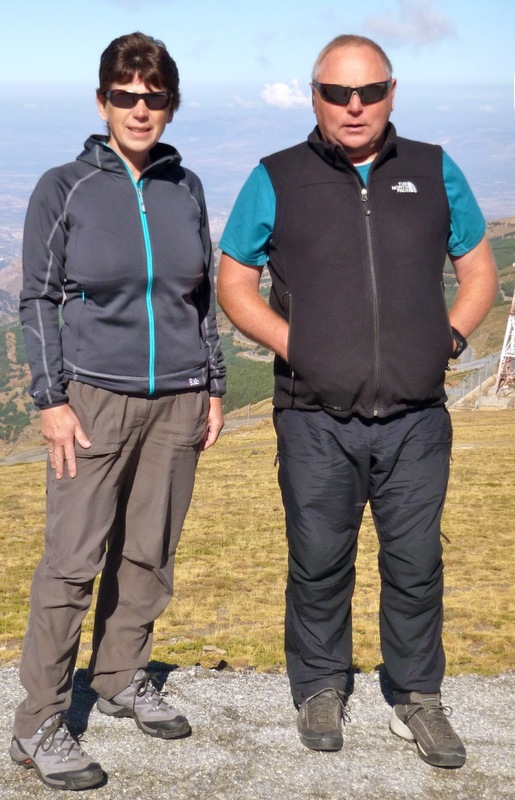 Mike and Jane from Mountain House Holidays are always willing to advise you to plan your walking holiday in Slovenia. It has been great to meet lots of you over the summer, which saw us spending time in Spain, Scotland, Swaziland and Slovenia. Now we are back in Derbyshire and the nights are drawing in, we are working on our programme for 2015, and wanted to share a few of our ideas with our friends and customers. Mt. Olympus, "home of the Gods"
"Mt. Olympus, home of the Gods"
the highest mountain in Greece. This is a walking itinerary but with some “exposed” paths. If you are interested in joining us, we’d really like to hear from you. Munro bagging in Torridon, some of the more difficult mountains in Scotland. Six days of guided walking. We are trying out a new navigation course, designed for more 'mature' walkers, who are available during the week, and would appreciate learning in a smaller group or at a slower pace. If you know anyone who might be interested in Map Reading for Mature Walkers, do pass on the information. Don’t forget: All our navigation courses can be bought as gifts, so why not choose one (or 2) for friends and family this Christmas. Sierra Nevada Guides are once again hosting a week of winter skills training in Spain's Sierra Nevada mountains. This year we plan to spend most of the week at the Poqueira Refuge, high in the mountains where we can put the new skills to good use. Next spring and summer we will be spending more time in Spain, so if you are interested in joining us during April, May, June, July & early August we can offer daily guided walks from the wonderful base of the hotel Alcadima starting and finishing at a date of your choice. (We were fortunate to spend a few days in September as guests at the Alcadima and really enjoyed the experience.) Our programme of daily walks cost 40 Euro's per day. We always appreciate hearing from you with feedback, suggestions and requests for trips. If you are part of a group we can offer special rates on our holidays, or design a map reading, navigation or GPS course specially for you, so let us know what you would like.